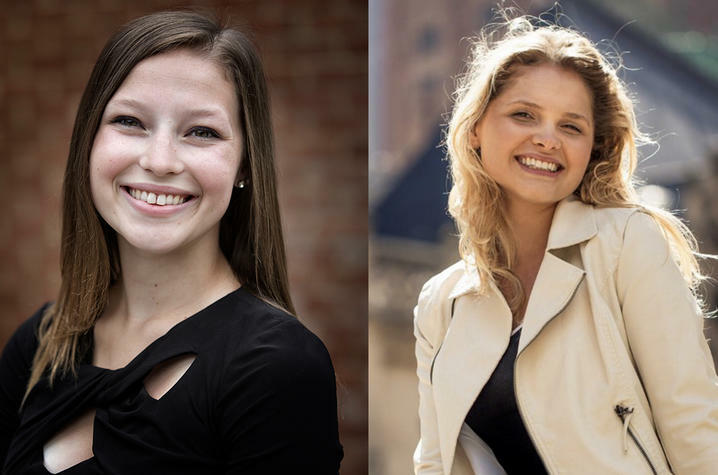 LEXINGTON, Ky. (Dec. 7, 2018) — Two student representatives have been selected to speak at the December 2018 University of Kentucky Commencement Ceremonies. The ceremonies will be held at 10 a.m. and 2 p.m. Friday, Dec. 14, at Rupp Arena. Kelsey Allmon, from Grove City, Ohio, will speak at the 10 a.m. ceremony on Dec. 14. She is graduating with a master's degree from the Patterson School of Diplomacy and International Commerce. She earned two bachelor's degrees just last year from the Gatton College of Business and Economics and the College of Arts and Sciences, and was also a student in the Lewis Honors College. During her past five years at UK, Allmon has been involved with the Lab for Economics and Accounting Proficiency (LEAP), Cru Campus Ministry and Club Dodgeball. She was also inducted into Phi Beta Kappa and Phi Kappa Phi honor societies. As a foreign language and international economics and German studies double major, she was also inducted into the Delta Phi Alpha National German Honor Society and studied abroad in Berlin, Germany. As a graduate student, Allmon has served as chair of the networking committee for the Graduate Student Congress. "From the first time I came on campus, people have been so kind to me," Allmon said. "One of my favorite stories to tell is that I was walking back to my dorm from a football game my freshman year and President Capilouto stopped me to shake my hand, ask me where I'm from and what I'm studying, and tell me he's happy to have me on campus. It was something so little, but it made me feel so welcome." In her commencement speech, Allmon hopes to give back a little of what she's learned. "UK has made me the person I am," she said. "I feel like this is where I grew up, and who I am today is a direct result of my experience here. I've had some of my best and worst times here, and I really think what made the difference was the people I met." After graduation, Allmon plans to work internationally in the private sector. Kendall Hitch, from Troy, Michigan, will speak at the 2 p.m. ceremony on Dec. 14. She is graduating with a bachelor's degree in political science from the College of Arts and Sciences and the Lewis Honors College. Hitch came to UK in 2014 as a Patterson Scholar and immediately began working with her professors and fellow students to bring Amnesty International to UK's campus. As the program's co-founder and president, Hitch organized weekly meetings, created and ran the academic and social organizing conference "My body, my rights," and developed a community dialogue series on the refugee crisis. Hitch was also a founding board member for the UK Center for Student Philanthropy, and has worked as a tutor in the Gatton College of Business and Economics and the UK Center for English as a Second Language. Additionally, Hitch earned an international certificate to teach English as a second language that she has used while studying, researching and interning abroad in China, South Africa, Mexico and Argentina. Hitch is now in the process of founding a nonprofit organization called Abroadband Connections that uses educational technology to implement both English language lessons and cultural exchange. She will be working with this program as part of a master's in education program at Indiana University this summer. "Intercultural education was a transformative experience for me, and I hope I can get more people involved in my mission," she said. In her commencement address, Hitch hopes to motivate her fellow UK graduates by emphasizing how powerful they can be as individuals, if they accept help from others. "I can say with 100 percent confidence that my college experience would not have been the same somewhere else; I had consistent support of professors, mentors and fellow students with every exciting, but sometimes challenging, step I took toward accomplishing what I have accomplished today," she said. "Overall, I felt UK offered the potential for a very personalized learning experience, and I was right." For more information about the UK Commencement ceremonies, visit www.uky.edu/commencement.